I hope that you can get some early tomatoes. We may end up buying some tomato plants this year. I think we got some bad seeds or something. We will have to wait and see. 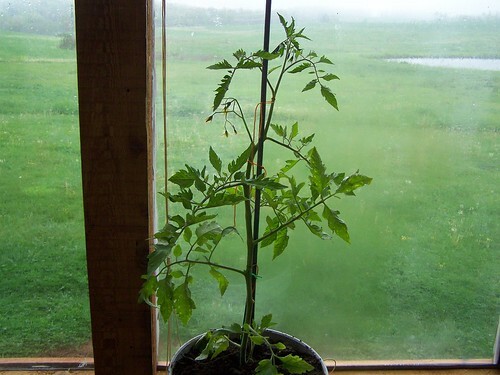 That is a huge tomato plant! We should go to Slaughters together one day. I have never eaten dry land fish before, but James talks about them a lot. I would have fun in the woods looking for them even if I didn’t like them 🙂 I hope you guys have tons of fun tomorrow. I can’t wait to see the pictures. Please pray that we make wise decisions about everything. I feel a streak of no blogging coming on for me. When I have decisions to make I always avoid everyone and everything and just pray a lot. Talk to you Friday. Hi Donna.. We love mushrooms but have never picked any.. Terry’s Dad used to pick them all the time but we don’t know which are good or poison..
We are soooooo far behind you in our season..
That doesn’t bother us as we are used to it and I guess you don’t miss what you have never had..